Mickey Monthly- Magic Delivered To Your Doorstep! 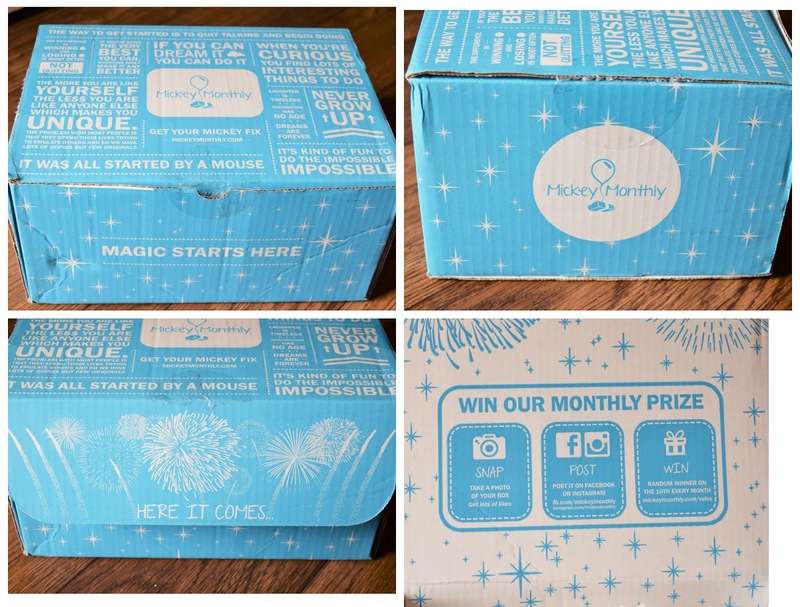 HomeMickey Monthly- Magic Delivered To Your Doorstep! I am a HUGE Disney fan. I have a whole section dedicated to it alone. When I heard of Mickey Monthly, I was SO STOKED. If you haven't heard of them, Mickey Monthly is a monthly subscription box of handpicked souvenirs and snacks exclusively from Disney World, automatically delivered directly to your door, every month. Choose from one of three magical subscription boxes ranging from individual, to family sized. We even customize your monthly shipment to girl, boy, or fun for all! They have an Original Mickey Monthly Box- you can choose two versions of this. Classic is $25 in value and $19 a month, and Magic is $50 in value and $39 a month. They have the Pin Edition Mickey Monthly Box- There are four versions of this box. PinPal for $7.95-This includes one gently used pin. PinPro for 14.95 a month- this includes one brand new shiny pin with no backing. PinTastic is $19.95 a month and includes a brand new pin with backing and they are sold at Disney Parks and are open edition and lastly, PinCollector for $29.95 a month- This is one of the current months limited Edition Pins! The last version is Theme Park Edition Mickey Monthly Box. There are four versions of this box. Fairy is a surprise box of 2-4 basic park items for $29.95 a month. Mickey is a mix 2-6 medium Disney Parks Items for $49.95 a month. Castle is a mix of 2-8 medium and large Disney Parks Items for $79.99 a month and lastly- the Kingdom Box! It is a HUGE mix of medium and large 4-12 items for $199.99 a month. Let's talk packaging. WOW. This packaging is ADORABLE! I love how magical it is! Each side is perfect. It gets you even more excited to get this box! I love the cute sayings all over it. So cute! When you open it, the "Here It Comes" on the flap of the box is just the cutest thing because I feel like a child opening this. It gets you more and more excited! The inside of the box- There is MICKEY CONFETTI! This is the cutest little touch that I have ever seen! How adorable! I was so thrilled to open my box and find these goodies. The majority my 9-year-old will steal, but I love it all! This Mickey Plush is the cutest. I already have it in my bathroom! It matches the decor! SEE the bottom of this post to see what I am talking about. My Disney Villan water bottle is SO CUTE!!! I LOVE THIS! I now have a Disney Parks 2016 Collector Pin! I wanted one of these. This crafts book will keep us busy on a rainy day. =) SO cute! Lydia loves it! My kiddo is obsessed with lip balm so this is perfect. She has already took it from me as well as the brush too. I love the Finding Dory Watercolor Paints. Lydia will also use this on a rainy day. The Minnie Apple Scented Hand Sanitizer is already in my handbag to use. Lastly, the Mickey Mouse Special Edition Jelly Bellys! Overall, I LOVE my Mickey Monthly box! This box is such an adorable idea! This will make a great gift to yourself or great gift to anyone- any age. It is magical and lovely! You can visit their website and subscribe today. You can also cancel at any time. Be sure to visit Mickey Monthly on their social channels to stay up do date with the last. I placed my Mickey plush on the first shelf in my bathroom! Too cute!